Zakk Wylde Goes To Prison. We have to admit, when our friends at Classic Rock posted that headline today we went, "What? Has the Zakkster run afoul with the law somehow?" Turns out the bench-pressing guitar star did spend a little time in a Singapore prison today, but it's not what you think: Wylde played for inmates at the Changi Prison and participated in a question-and-answer session. 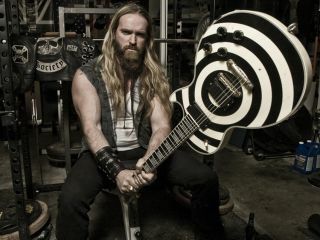 Wylde, who played a ripping half-hour set for 40 prisoners, described his visit as "trying to brighten their day with the soothing sounds, stylings and motifs of Black Label Society." This wasn't Zakk Wylde's first time behind penitentiary walls. In 1987, his first gig with Ozzy Osbourne was a trial-by-fire affair at the Wormwood Scrubs Prison in Hammersmith. Referring to that show, Wylde said that today's event "seemed like the right thing to do."